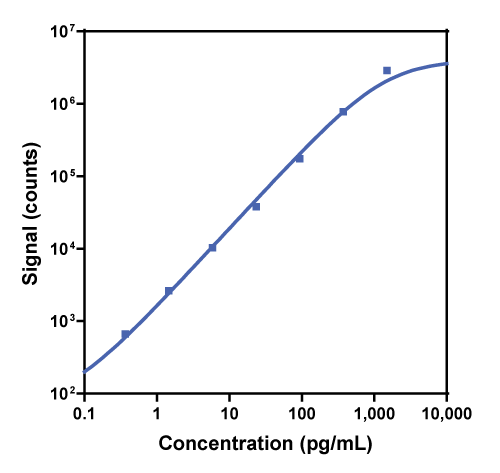 The R-PLEX Human GLP-1 (active) includes a matched capture and detection antibody pair and calibrator for the quick and easy measurement of GLP-1 (active) in biological samples. R-PLEX products leverage MSD’s electrochemiluminescence technology for better sensitivity and a larger dynamic range than traditional ELISAs. R-PLEX matched antibody sets enable the development of singleplex and multiplex immunoassays. Individual assays may be developed using MSD avidin- or streptavidin-coated plates. Custom multiplex assays with any combination of R-PLEX analytes, as well as R-PLEX plus U-PLEX analytes can be developed on U-PLEX MULTI-SPOT plates. To learn more about the advantages of R-PLEX products click here. Calibration curve for the R-PLEX Human GLP-1 (active) was assessed and representative data is presented below. Description - Glucagon-like Peptide 1 (GLP-1) plays a key role in the promotion of glucose-dependent insulin secretion and insulin biosynthesis. GLP-1 works in concert with insulin to inhibit glucose secretion and lower overall blood glucose levels. It plays roles in gastric emptying and in the regulation of short-term feeding behavior. GLP-1 can provide beneficial, cyto-protective effects on neuronal cells, skeletal muscle, and the myocardium. This antibody set recognizes human GLP-1 (active). Samples from other species were not tested.